Love the look of hardwood flooring but not the price? 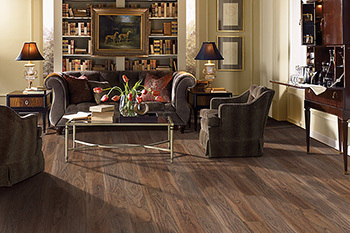 Get that luxury new wood floor look for less with a designer vinyl plank floor. It is a type of flooring that is gaining popularity due to the photorealistic textures available as well as the affordable price per square foot, and flexibility to install over an existing subfloor. Vinyl plank flooring is an excellent choice for any renovation project. This new style of vinyl floor is thick in structure and cut in similar sizes as natural wood flooring planks. Installed as individual pieces (the same way a wood floor would be installed) the style of the vinyl plank closely mimics quality hardwood or laminate flooring. You won’t believe the texture and colors we have available and once installed, it is hard to tell the difference between a vinyl plank floor and a natural wood floor. Vinyl plank flooring can be installed as a floating floor over virtually any surface such as plywood, particle board, concrete and other subflooring. In order to get a flush fit to the wall, moldings are removed or undercut and replaced after installation of the new floor. The method of installation is generally parallel to the longest wall in the room to create the appropriate scale and balance. The planks are installed in a staggered pattern to imitate a hardwood floor pattern and it is rolled afterward to ensure a quality seal and level finish. This type of flooring is very popular for rooms which are susceptible to moisture and where wood floors are not feasible or the best choice. They are an excellent option for kitchens and bathrooms, but also basements. They can also be used to floor recreational vehicles and boats to create a durable wood-look for less.